Pioneers in the industry, we offer fag plummer block housing, linear rolling bearings and linear plain bearings, roller monorail guidance systems, ball monorail guidance systems, miniature ball monorail guidance systems and linear ball bearing units from India. 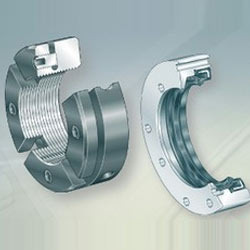 Axial lubrication groove in the upper section of the housing to ensure optimum lubricant supply for bearings in every bearing position - for example using FAG CONCEPT8. The focus during development of the new SNS plummer block housing was on compliance with customer and application-specific requirements. Criteria such as increasing efficiency, robustness and improved condition monitoring played a major role. Predefined positions for condition monitoring systems, mounting services and maintenance tools round out the new design. Linear bearings are bearing elements for translation type motion. As in the case of rotary bearings, a distinction is drawn as to whether the forces occurring are transmitted by means of rolling or sliding elements. The requirements placed on linear components are as varied as the applications in which they are used. In transport and feed systems, it is mainly speed and accuracy that are required while, in measuring machines for example, the emphasis is more on precision and rigidity. In order to find the right linear guidance system for the specific task, both a sophisticated product range and detailed consultation are important. 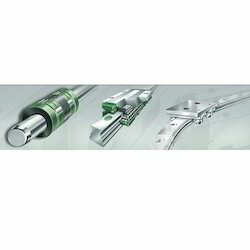 INA offers both: a wide range of linear products, combined with expert service. Furthermore, a range of accessories precisely matched to applications allow even greater optimisation of the comprehensive standard versions of guidance systems. 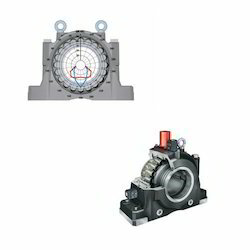 Each linear design has particular characteristics that make it especially suitable for particular bearing arrangements. Generally applicable rules for selecting the type of guidance system can only be formulated up to a point, since more and more factors must be taken into consideration and weighed up against each other. Apart from load, acceleration, speed and stroke, factors including temperature, lubrication, vibration, mounting, maintenance etc. must be taken into consideration. Linear rolling bearings are available as monorail guidance systems, track roller guidance systems, shaft guidance systems with linear ball bearings, flat cage guidance systems, guidance systems with linear recirculating roller or ball bearing units and as driven units (actuators and tables). Furthermore, INA also manufactures special miniature guidance systems for small design envelopes such as those in mechatronics and precision engineering. These very compact elements with very high load capacity, low friction and high rigidity are available as cage or recirculating systems. Due to their compact design, they can often replace solutions requiring significantly greater space. The guidance systems comprise a guideway/carriage unit, a linear bearing/shaft system or are guideway/guideway units with roller or ball flat cages between them. Driven linear units are single-axis or multi-axis complete systems with a mechanical guidance system, an electric motor and a controller matched to the system. Linear guidance systems are ready-to-fit locating bearings predominantly for unlimited stroke lengths. Flat cage guidance systems and linear guidance sets are, with a few exceptions, used for restricted stroke lengths due to the cage kinematics. The bearings support forces from all direction - except the direction of motion - and moments about all axes. Shaft guidance systems with linear ball bearings are suitable for loads from two directions and can compensate for static shaft misalignment. For the high rigidity and accuracy often required in operation, most units are supplied ex works preloaded or can be preloaded at fitting. Due to the various accuracy and preload classes, applications can easily be realised with high guidance and positional requirements. In order to determine the size of guidance system, attention is paid primarily to the magnitude and type of load and the requirements for operating life and operational reliability of the bearing arrangement. In general, roller bearings can be subjected to higher loads than ball guidance systems of comparable external dimensions. Ball guidance systems are therefore normally used for small to moderate loads and highly dynamic motion, while roller guidance systems are used for high loads. If particularly high loads must be supported, flat cage and recirculating roller guidance systems are particularly suitable. Linea recirculating roller bearing and guideway assemblies RUE are, due to the use of cylindrical rollers, the INA monorail guidance systems with the highest load carrying capacity and rigidity. They comprise at least one carriage with a full complement roller system, a guideway, integrated elastic wipers on the end faces of the carriage, sealing strips on the upper and lower faces of the carriage and closing plugs to close off the fixing holes in the guideway. The carriage and guideway of a linear recirculating roller bearing and guideway assembly are matched to each other as a standard system due to their closely toleranced preload. It may be possible, after consultation, to use carriages and guideways in different combinations. Linear recirculating roller bearing and guideway assemblies are suitable for accelerations up to 100 m/s2, speeds up to 180 m/min and operating temperatures from –10 °C to +100 °C. They are used in applications with long unlimited stroke lengths, high and very high loads and high to very high rigidity. Six-row linear recirculating ball bearing and guideway assemblies KUSE are the ball-based guidance systems with the highest load carrying capacity and rigidity. They comprise at least one carriage with a full complement ball system, a guideway, integrated elastic wipers on the end faces of the carriage, sealing strips on the lower face of the carriage and plastic closing plugs. Linear recirculating ball bearing and guideway assemblies KUSE are suitable for accelerations up to 150 m/s2, speeds up to 300 m/min and operating temperatures from –10 °C to +100 °C. They are used in applications with long unlimited stroke lengths, high and very high loads and high to very high rigidity. Four-row linear recirculating ball bearing and guideway assemblies KUVE are the most versatile and comprehensive range of monorails from INA. These units comprise at least one carriage with a full complement ball system, a guideway, integrated elastic wipers on the end faces of the carriage, sealing strips on the upper and lower faces of the carriage and plastic closing plugs. 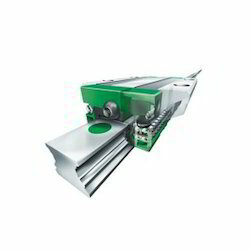 Linear recirculating ball bearing and guideway assemblies KUVE are suitable for accelerations up to 150 m/s2, speeds up to 300 m/min and operating temperatures from –10 °C to +100 °C. They are used in applications with long unlimited stroke lengths, high loads, high rigidity and low friction. The units are also available in a design with optimised noise to X-life quality. Two-row linear recirculating ball bearing and guideway assemblies are the economical alternative where guidance systems with moderate load requirements are concerned. The units comprise at least one carriage with a full complement ball system, a guideway, integrated elastic wipers on the end faces of the carriage, sealing strips on the lower face of the carriage and plastic closing plugs. The linear recirculating ball bearing and guideway assemblies are suitable for accelerations up to 150 m/s2, speeds up to 180 m/min and operating temperatures from –10 °C to +100 °C. They are used in applications with long unlimited stroke lengths, moderate loads, moderate rigidity and low friction. These guidance systems are preloaded linear locating bearings for limited and unlimited stroke lengths. These have moderate load carrying capacity and moderate to high moment load carrying capacity. Due to the modular concept, guideways and carriages can be interchanged within one interchangeability and accuracy class. This gives easier fitting of guidance systems, easier sourcing of replacement parts and allows very economical stockholding. The saddle plates and guideways are corrosion-resistant. Seals on the end faces of the carriages protect the rolling element system against contamination. The carriages are greased and can be relubricated. The guideways and carriages are also available in a wide version. Four-row miniature linear recirculating ball bearing and guideway assemblies are ready-to-fit guidance systems for unlimited stroke lengths. They have high to very high load carrying capacity and rigidity. The saddle plates and guideways are corrosion-resistant. Seals on the end faces of the carriages protect the rolling element system against contamination. Due to the lubricant reservoir, the relubrication intervals can be extended. Linear guidance systems with linear recirculating ball bearing units comprise ball bearing units, carriages and guideways. They allow large support distances, have adjustable clearance and are to standard accuracy class G3. The full complement bearing units run on one or both sides of the guideways and, despite their small dimensions, have high load carrying capacity. If the bearing units are screw mounted in carriages, together with the guideways they form four-row linear recirculating ball bearing and guideway assemblies. The ball bearing units are sealed on all sides by the wipers on the end faces and on the sealing strips which form a gap seal in conjunction with the guideway. Linear recirculating ball bearing units can be relubricated. The carriages comprise an anodised aluminium body and two linear recirculating ball bearing units. The carriage has two T-slots for fixing to the adjacent construction. The clearance can be adjusted by means of three screws on the side of the carriage; the screws press on the back of the bearing unit. The guideways are available with raceways on one or both sides. They are made from hardened steel and ground on all sides. 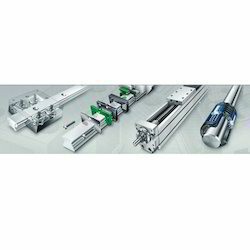 The linear actuators contain all the components required for operation in a modular concept. 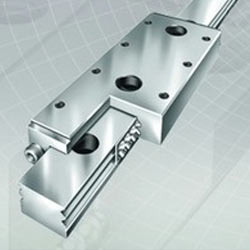 Linear actuators are guided by linear recirculating ball bearing and guideway assemblies of series KUVE or KUSE or by track roller guidance systems LF. They are driven by means of a ball screw drive, toothed belt or direct drive (linear motor). The range of driven linear units is rounded off by controllers, motors and gearboxes that are optimally matched to each other. Linear tables are used where larger masses must be moved in one or more axes. Due to the large support distances, linear tables are also suitable for supporting high load moments. The guidance systems are linear ball bearings or linear recirculating ball bearing and guideway assemblies. Linear tables are supplied either without a drive or with a ball screw drive, trapezoidal lead screw drive or direct drive. 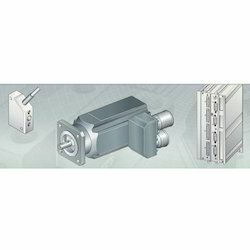 Suitable for all series of driven linear units, INA also offers the optimum combination of drive components for fulfilling customer requirements. Finely graduated servomotors are available for all linear units together with precise planetary gearboxes for a wide range of applications. We of course provide the most modern control technologies for controlling the motors and thus offer high performance of INA linear actuators. Controllers are put into initial operation by means of a user-friendly initial operation tool, advance initial operation of the the linear actuator or linear table is offered as a service. The highly dynamic servomotors are available with an absolute encoder or a resolver and with or without a holding brake. Connection to the controller can be achieved easily and quickly using matched cables that are available in various standard lengths. For adjustment of the torque, the customer can select from single stage and twin stage low-clearance planetary gearboxes. Further accessories include matched connection lines for the controller, mains filters, fix resisters, motor chokes and various proximity switches for mounting on INA linear actuators and linear tables. With these products, we can fulfil your positioning requirements safely, rapidly and economically. With the proven standard multi-axis positioning systems, many applications can be realised without additional design work. This makes it possible for you to rapidly implement your project on the basis of components that are already matched to each other. Your design and planning work is reduced considerably and, within a very short time you will receive fom us a proposal for a positioning system with your required axis travel distances. The standard three-axis positioning systems are currently available in two classes: for a moving mass of up to 5 kg or up to 15 kg. The basic design comprises the M/V guideway pair and angled flat cages containing needle rollers or cylindrical rollers and is a linear locating bearing. The guideways are supplied in grades Q2, Q6 and Q10. The cages are made from metal or plastic. Metal cages are suitable for more demanding conditions such as high acceleration, high temperatures and where the ends of the cage are exposed at some point in operation. Plastic cages are particularly economical for simple operating conditions. Accessories include end pieces for the guideways and wipers to protect the raceways against contamination. These guidance systems comprise M guideways with a plain sliding layer and V guideways as a mating track. They are used particularly for supporting static or pulsating loads, where lubrication is not possible or only initial lubrication can be provided or where an increased friction level is required in order to provide damping. The guidance systems are also suitable for oil or grease lubrication and have the same mounting dimensions as M/V guideways with flat cages. The guideways are supplied in grades Q6 and Q10. These guidance systems comprise J and S guideways separated by needle roller flat cages. 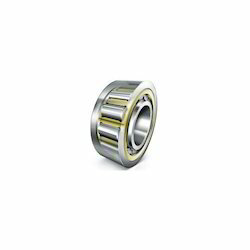 They are used as non-locating bearings and for limited stroke lengths. 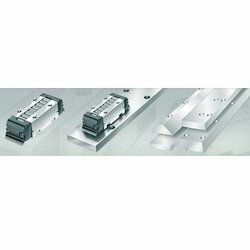 The guideways are supplied in high and flat versions. The cages made from metal or plastic and are of single or double row design. This counterstay system is a linear locating/non-locating bearing unit. Due to the subdivision into locating and non-locating bearing arrangements, the system is not distorted by thermal expansion. The locating bearing system comprises M/V guideways and the non-locating bearing system J/S guideways. Needle and cylindrical roller flat cages are arranged between the guideways. The guidance system is preloaded by an L-shaped counterstay. The guideways are supplied in grade Q2. The counterstay system is used where guidance systems must have high accuracy with extremely high rigidity and load carrying capacity and the adjacent construction must not be distorted by preload forces or thermal expansion. It has the highest accuracy of any rolling element linear guidance system, is particularly low-friction and very easy to fit, requiring no adjustment work after mounting. 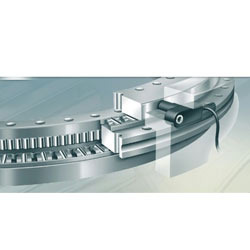 The linear roller bearings are available in a design in which the cylindrical rollers are separated from each other by spacers, a full complement version and an angled version element. The design with spacers runs particularly smoothly and quietly and is sealed on its end faces. Full complement linear roller bearings are suitable for high temperatures, speeds and accelerations. Angled elements are particularly suitable, due to the 90° arrangement of two linear roller bearings, for closed arrangements. This design is sealed on all sides. Due to their high precision, the guideways in conjunction with the linear roller bearings give high precision linear guidance systems. They are made from through hardened rolling bearing steel, have precision ground raceways and are available as a single piece up to the maximum length. Longer guideways are made up from matched sections. The guideways are supplied in grades Q2, Q6 and Q10. Machined needle roller bearings have long been a proven machine element in the design of radially space-saving, very stable bearings. Now, in the X-life version, they are even more attractive with a lifespan up to 50 % longer. The load-bearing capacity of X-life needle roller bearings has been increased even further by improving the surface quality. The dynamic load rating has been increased by 13 % in comparison to previous needle roller bearings. 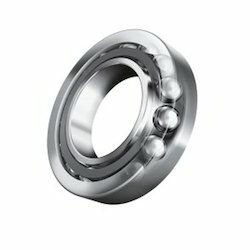 This clear improvement in load ratings results in more efficient bearings with a longer life, lower lubrication demands, less friction and thus lower bearing temperatures. For you, all of these developments mean greater efficiency for your applications and a significantly better cost-performance ratio. 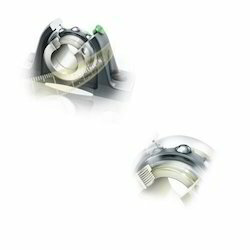 INA radial insert ball bearings and housing units have set the new standard with? X-life. The efficacy of the corrosion protection has tripled in many cases thanks to the use of Corrotect® N instead of Corrotect® A. This is not only the case for radial insert ball bearings but also all sheet steel housings! New INA X-life radial insert ball bearings - measurably superior! Our High-Performer now up to 70% longer service life with the same loads. For more efficiency and operational reliability. FAG E1 spherical roller bearings are used in all kinds of applications where heavy loads have to be accommodated or where shaft deflections or misalignments of bearing seats must be compensated for. They operate reliably in the harshest environmental conditions, for example in gearboxes, paper machines, construction machinery and vibrating machinery. E1 X-life spherical roller bearings are designed in accordance with DIN 635-2, eight different series from narrow to wide, for shafts from 20 to 200 mm, with outside diameters from 52 to 320 mm, cylindrical or tapered bore, as standard, fitted with lubrication groove and lubrication holes in outer ring, cages of glass-fibre reinforced polyamide, sheet steel or brass, special designs for specific operation conditions. The operating life has now been more than doubled. For more cost-efficiency and operating safety. Axial spherical roller bearings E1 are capable of supporting very high axial loads and allow relatively high speeds. Both under the harshest of operating conditions. For example in gearboxes, calenders, engines in marine applications and rudder engines, lifting gear, construction machinery and rolling mills. The transition to the new design of axial spherical roller bearings will begin with the bearings of heavy series 294..-E1. 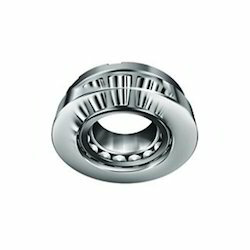 These bearings are predominantly used in response to very high requirements for load carrying capacity. 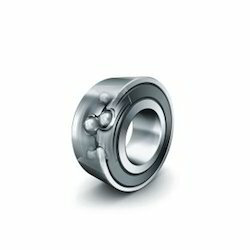 Smaller bearings of series 294..-E1, as well as smaller bearings of the medium heavy series 293..-E1, have sheet steel cages. The larger bearings of these two series have a solid brass cage as standard. 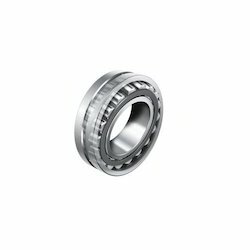 Numerous bearings of the series 293..-E1 and 294..-E1 are of X-life quality. These bearings are indicated in the dimension tables. Zero Maintenance now with 25 % longer life. For more efficiency and operational reliability. ELGES large spherical plain bearings. High load ratings, low friction, great operational safety – even in harsh environmental conditions, such as bridges, hydraulic steel structures, buildings and cranes. Our efficient Elgoglide® sliding coating guarantees zero maintenance for life. Just install it and forget about it. The improved ELGOGLIDE ensures longer sliding distances, and consequently a longer service life. Increased range of applications power requirements. Elgoglide® is a group of maintenance-free Teflon® sliding layers. We can therefore offer you the right bearing with a sliding layer that is perfectly matched to the operating conditions. Elgoglide®-800: High-performance sliding layer for high contact pressures – up to 300 MPa dynamic. Elgoglide®-600: For low contact pressures – from as little as 1 MPa – and applications for which minimal friction is required. with high radial and axial load carrying capacity. Now with up to 50% longer operating life. 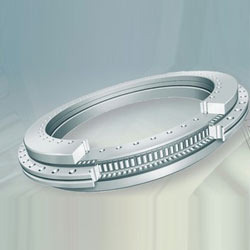 High speeds and high axial loads are typical operating conditions for single row angular ball bearings, for example, in gearboxes, turbines and ventilation systems. Additional requirements are often placed on the bearings if they are used in pumps and compressors, for instance, resistance to high temperatures and low maintenance requirements. In order to meet these requirements reliably and cost-effectively, the precision of the raceway profiles was improved, the surface quality was optimized and the manufacturing processes were refined. Very high radial load ratings and their suitability for high speeds have made cylindrical roller bearings top performers in the field of application engineering for years. 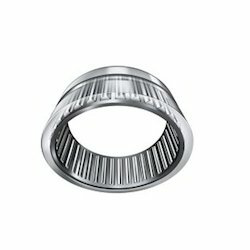 Thanks to an improved surface quality, the load ratings of X-life cylindrical roller bearings have been increased even further. The dynamic load rating is ca. 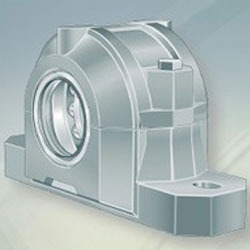 18 % higher than in the older style used cylindrical roller bearings. The basic rating life has increased by up to 70 %. Double row angular contact ball bearings of X-life quality offer a longer operating life, especially in use under axial load conditions. They are therefore particularly suitable for use in pumps and agricultural machinery, for applications in conveying equipment and packaging equipment, elevators and compressors. Yoke Type and Stud Type Track Rollers now even more efficient PWKR and PWTR series. 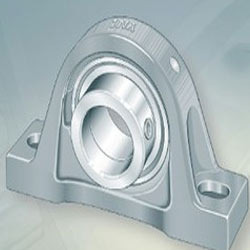 Robust bearing supports, longer operating life. Yoke type and stud type track rollers are often used for transmitting high radial loads. As X-life yoke type and stud type track rollers, they make a convincing case through even higher performance capability. By changing the materials and optimizing the raceway geometry in the outer ring, the basic rating life has increased by up to 30 percent. Dynamic and static load carrying capacity was also increased. In addition, the optimized outside surface profile and its improved surface quality on the outer ring reduces the stress on the mating track This results in a very robust bearing support with longer operating life and higher reliability in the application. Up to 30% higher static and dynamic load carrying capacity due to optimized raceway geometry. Higher permissible ring load by changing the material of the outer rings. Improved outside surface quality by optimizing the surface structure. Increased protection against corrosion due to Corrotect® coating. Just ask us about the new INA yoke type and stud type track rollers PWTR and PWKR in X-life quality. Seal carrier assemblies DRS are screwed to the centre washer of needle roller/axial cylindrical roller bearings and precisely centred there. They seal the bearings from the outside. The sealing elements are supplied as a complete set and comprise a seal carrier with an integral rotary shaft seal, a gasket and socket head cap screws for mounting the carrier on the centre washer of the bearing. Axial/radial bearings and axial angular contact ball bearings are ready-to-fit high precision bearings for high precision applications with combined loads. They can support radial loads and axial loads from both sides as well as tilting moments and are particularly suitable for bearing arrangements with high requirements for running accuracy, for example in rotary tables, face plates, milling heads and reversible clamps. Due to the fixing holes in the bearing rings, the units are very easy to fit. The bearings are radially and axially preloaded after fitting. a MEKO/U electronic measuring system. The electronic measuring system contains two measuring heads, a set of shims and an electronic evaluation system. Bearings of series YRTM correspond in mechanical terms to axial/radial bearings YRT but are additionally fitted with a magnetic dimensional scale. The measuring system can measure angles to an accuracy of a few angular seconds by non-contact, magneto-resistive means. gives savings on design envelope size and costs due to the compact, integrated design requiring fewer components. Radial insert ball bearings are single row, rady-to-fit units comprising a solid outer ring, an inner ring extended on one or both sides, cages made from plastic or sheet steel and P, R, L or T seals. 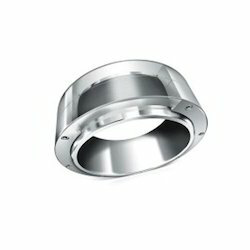 Bearings with an inner ring extended on both sides undergo less tilting of the inner ring and therefore run more smoothly. The outer ring has a crowned or cylindrical outside surface. In conjunction with an INA housing matched to the bearing type, bearings with a crowned outside surface compensate for shaft misalignments; see Compensation of misalignments. 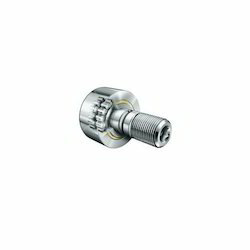 Some series with an eccentric locking collar and with grub screws in the inner ring are also available with an inch size bore. INA housing units are available in many different designs as plummer block, flanged and take-up housing units. The ready-to-fit units comprise INA cast iron or INA sheet steel housings in which the INA radial insert ball bearings are integrated. In order to ensure correct function and operational reliability in all operating conditions, the bearing and housing are matched to each other. Due to the spherical outside surface of the bearing outer ring and the spherical housing bore, INA housing units can compensate for static angular misalignment of the shaft; see Compensation of misalignments. 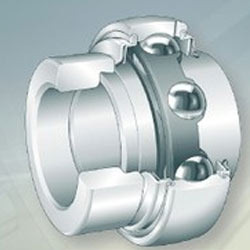 The units are used predominantly as locating bearings, but can also be used as non-locating bearings under low loads and speeds. The housings are screw mounted on the adjacent construction. Less demanding tolerances are sufficient for the screw mounting surfaces. 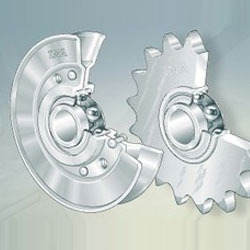 INA roller chain idler sprocket units are chain guidance and return units for roller bush chains and roller chains. They compensate chain stretch resulting from operation and improve the smoothness of running of the system at high loads and speeds. The ready-to-fit units comprise chain sprockets and deep groove ball bearings. The chain sprockets are made from high strength steel, sintered iron or plastic (polyamide). Chain sprockets made from plastic give especially smooth and quiet operation. Since the inner ring of the deep groove ball bearing is extended on both sides, no additional spacer rings are necessary. In series KSR..BO, the inner ring is locating on the shaft by means of a locking collar. 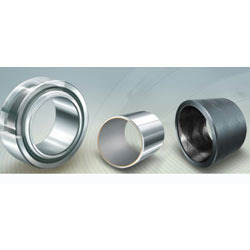 The bearing bore of this series has a plus tolerance. As a result, unmachined shafts up to ISO tolerance h9 can be used under moderate loads and speeds. reduce the wear on the belt drive. The ready-to-fit units comprise deep drawn, profiled sheet steel halves that are riveted together and deep groove ball bearings. Larger diameter pulleys are additionally welded. A lead chamfer on the pulley profile prevents belt damage. Due to the sheet steel construction, the additional rotating masses and imbalances generated are only slight. Type A is suitable for V-belts, type B for flat belts, V-belts and round belts, type D for round belts as well as steel cables and hemp ropes. The Schaeffler Group produces and distributes a wide range of high-quality plain bearings with the INA brand. These include plain bushes with ELGOTEX® and ELGOGLIDE® as well as metal-polymer composite plain bearings. There is also a proven range of ELGES spherical plain bearings. This means we can supply the right plain bearing for almost every application. Track roller guidance systems are linear guidance systems that can be compiled according to a modular concept for a wide variety of applications. Due to their lightweight construction, they are highly suitable for use in handling systems. They are particularly characterised by quiet running, high traverse speeds, long displacement distances and the modular concept. Track roller guidance systems comprise one or more aluminium carriages, profiled track rollers and a straight or curved guideway. Carriages are available as hollow section carriages, open carriages, compact carriages and bogie type carriages for curved, oval and circular guidance systems. 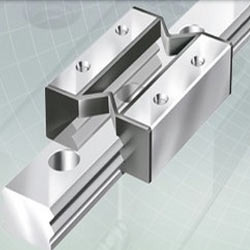 Guideways consist of an aluminium rail with shafts made from rolling bearing steel rolled into the sides. The guideways are available in many different designs, e.g. guideways with a solid profile, hollow section guideways, flat guideways, guideways with a slot etc. Selection depends on the puropse to which the track roller guidance system will be put. Shaft guidance systems or ball-based or plain linear guidance systems for various areas of use and applications. Linear ball bearings are available as a light range, compact range and heavy range. Mating tracks can be solid shafts, hollow shafts or supported shaft and rail units. The range is rounded off by a large selection of linear ball bearing and housing units and linear plain bearing and housing units. In this case, the linear ball bearings or linear plain bearings are supplied already mounted in ready-to-fit housings. A large number of shafts (with or without machined features), shaft and support rail units and comprehensive accessories allow a broad spectrum of applications. 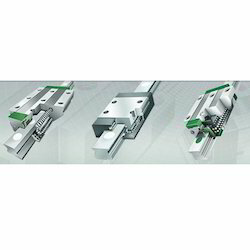 Miniature linear plain guidance systems are ready-to-fit, maintenance-free guidance systems. They have good sliding characteristics, are suitable for dry running, have adjustable clearance and are highly resistant to chemical influences. In terms of design space, miniature plain guidance systems have the same mounting dimensions as miniature linear recirculating ball bearing and guideway assemblies. The units are produced in various carriage sizes and guideway lengths, giving cost-effective designs. 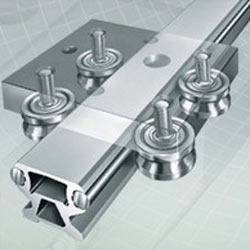 Miniature linear plain guidance systems are linear locating bearings with at least one carriage. They can support forces from all directions – apart from the direction of motion – and moments about all axes, operate largely free from stick-slip, have low wear and are insensitive to contamination. Miniature carriage units with cylindrical roller flat cages are corrosion-resistant, ready-to-fit cage guidance systems for limited stroke lengths. They have a high load carrying capacity, high rigidity and high accuracy whilst requiring very little space. Due to their compact design, they can often be used to replace guidance systems that require significantly more space. The units are produced in numerous carriage and guideway lengths, giving cost-effective designs. Miniature carriage units are linear locating bearings. They can support forces from all directions – apart from the direction of motion – and moments about all axes, are more rigid than linear recirculating ball bearing and guideway assemblies and run very smoothly and accurately. The units are particularly suitable for short stroke lengths, low-friction movements, oscillating movements and high loads with high rigidity. Their preferred areas of use include medical equipment, electrical engineering, robotics and laboratory equipment as well as applications under clean room conditions. 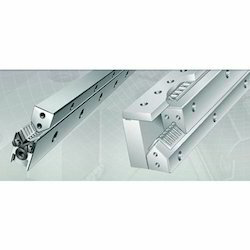 Miniature linear guidance sets with cylindrical roller flat cages are corrosion-resistant, ready-to-fit locating bearings for limited stroke lengths and are preloaded once fitted. These linear guidance systems have high load carrying capacity, high rigidity and high accuracy whilst requiring very little space. Since the distance between the guidance elements can be varied in design, the elements can be easily matched to predetermined adjacent constructions. The sets are supplied in many different lengths for specific applications. The sets are particularly suitable for short stroke lengths, low-friction movements, oscillating movements and high loads with high rigidity. Upon request, you will receive your individual system solution completely configured and ready for operation. All these service functions above are of course offered worldwide. For these applications INA offers its heavy-duty KUVE..B series in a full complement version. 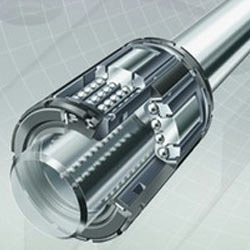 The INA engineers have integrated many functions, such as a 10% larger lubricant reservoir, variable connection of lubricant ducts as well as steady, slight displacement force etc., into the units, yet managed to keep them compact. Moreover, it is also possible to use the new carriages on the existing guideway profile. Units of the low-noise KUVE..B (KT) series are characterised by separation of the individual rolling elements by spacers. Thanks to a new design of the ball recirculation system, the development of noise is considerably reduced, by ca. 50% compared to KUVE..B. At the same time, the INA engineers have managed to reduce the masses of the entire guidance system by ca. 15% compared to the heavy-duty series. This means that the low-noise version, KUVE..B (KT), is very suitable for applications requiring high traverse speeds, high dynamics and as low a noise level as possible. Looking for Rotary Table Bearings ?